Onmyoji was available from a long time, but in the Chinese language, the English version of Onmyoji has been released recently on Google Play Store. 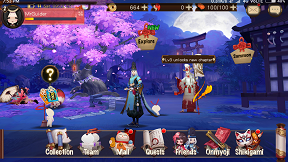 If you are a beginner and don’t know much about Onmyoji, then you should read this beginner guide for Onmyoji and take a look at some tips, cheats & strategy for Onmyoji to play it like a pro! The game starts with a tutorial in which you learn about the basic concept of the game; quest, Onmyoji, Shikigami, souls, skills, and much more. It takes a long time in completing of a tutorial. In the game, you play as Onmyoji and summon shikigami, and defeat the bosses. Onmyoji features three type of game modes; guild, explore/adventure mode, and story mode. In explore mode, you complete chapters, in which you defeat the bosses. In story mode, you meet new characters and battle against your enemies and earn the reward. Let’s start the Onmyoji guide – step by step. The main screen in Onmyoji is your courtyard, from there you can access to everything. Just tap on the scroll at the bottom right or expand all the options; collection, team, guild, mall, quest, friends, Onmyoji, Shikigami. There are also some more options excluding the above mentioned; explore, town, summon, and characters(Onmyoji). Onmyoji game features four characters; Seimei, Kagura, Hiromasa, Yao Bikuni. Among these Onmyoji, Seimei is unlocked, rest Onmyoji can be unlocked by completing chapters in explore mode. In the tutorial, you unlock Shikigami. You enter the battle with Shikigami and defeat the enemies with the help of them. So Shikigami is your right hand. Onmyoji features many Shikigami; rare, super rare, SSR. Each shikigami has own skill, you use in battles to defeat the enemies. Where to start in Onmyoji after you complete your quest? Once the tutorial ends, you can play the game manually. Just choose any mode out of all available. If you want to clear chapters, then tap on explore option on the courtyard/main screen. Tap on (…) three dots option to play story mode. If you have completed a chapter in Onmyoji, then next chapter will unlock after you complete the minimum requirement of profile level. You can check your level at the top right of the screen. To increase the level of your Onmyoji/your profile, win battles in the story mode. Onmyoji is a turn-based strategy game, you have to select your top best shikigami for the battle. 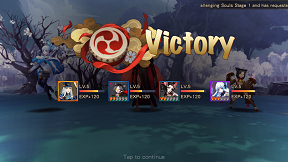 Getting a victory in Onmyoji is not a difficult task, you just need to use the skills of shinigami and Onmyoji at the right time or on the right target. You can switch or replace the shikigami before the battle starts with higher level shikigami(if you have). Shikigami is an important role in Onmyoji, if you are are a beginner, then you should know about the Shikigami. How do you get Shikigami? You can summon Shikigami using jades, mystery amulet, broken amulet, AR amulet, and by collecting shards. Jade is one of the rare resources in Onmyoji, you can get jades as the reward, from the shop, by getting victories in all type of game modes. Broken Amulet – It can be obtained by completing quest tasks, from the shop, as a reward. AR Amulet – It is used to summon rare, high-grade shikigami and can be obtained in special events, mall packs. Shards – Shards is another source to unlock shikigami in Onmyoji. You can collect shards demon parade, as a reward, by getting victories. So these are the ways and sources to summon or unlock shikigami in Onmyoji. You can equip souls to increase the attack, HP, Defend power of a shikigami. These souls can be earned by getting the victories, as a reward, from the shop. Head to shikigami section, tap on details, head to souls, tap on an empty slot, add souls if available. To increase the power of your soul, feed them. Tap on a soul and choose feed, select the souls you want to feed and confirm. To level-up shikigami in Onmyoji, take them to battles, and get the victory, your Shikigami will earn EXP, and once the threshold complete, your shikigami’s level will be increased. To promote a shikigami to the high level, tap on promote option, select the shikigami, and confirm. Keep in mind that it will remove the shikigami from your collection(only those who are selected to promote a shikigami). Use these tips & strategies in Onmyoji to defeat any powerful enemy or to complete chapters. You play as a team, and in the team, each individual share the best, if any of them is not giving the best, it would be a loss to the whole team. So if your Onmyoji is powerful and your shikigami is on low-level, then it would be easy for the enemy to slay down you. Increasing the power of shikigami boost up the attack, defend, HP, skill power. To increase the shikigami strength, equip them souls, level-up shikigami. Your Onmyoji has many types of skills, equip those which benefits you in the battle. Head to Onmyoji section, then skills, there you can see the skills of Onmyoji, tap on a skill and compare it with other skills, unequip low-level skills, and equip higher level skills. Get free rewards; jades, cards, action points, skills, and much more by completing the quest. Turn your shikigami into ultimate shikigami using souls. Spend coins to purchase souls. Head to mall section, then souls.